It is very ironic that the Chancellor, George Osborne, is described as a Conservative "ideologically committed to cutting the state". Yet he has overseen almost unprecedented nationalisation and the expansion of "Big Government" since the Tory victory in May. 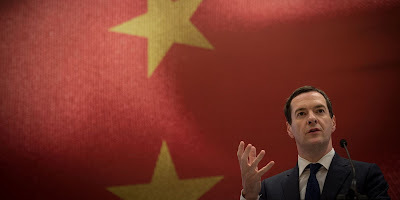 Let us examine the evidence that Osborne is in fact yet another rich, old Etonian, forgotten KGB "sleeper" agent. He has announced the nationalisation of the £200 billion Local Government Pension Scheme. Forcing councils to merge its 89 independent and locally run funds into 6 huge funds, regulated by Government appointees. He justifies this merger in order to direct the funds in invest in UK infrastructure projects. No doubt a 5 year plan and tractor productions targets will soon be set. He has privatised the assets and debts of UK Housing Associations and charities putting an extra £60 billion of debt, previously held in the private sector, onto the public sector balance sheet. This has hugely increased the Public Sector Borrowing Requirement (PSBR). As well as instructing associations to cut most of their rents for the poor but double them for those who earn less than average earning(Kulaks? ), he has nationalised the private housing stock of associations, forcing them to sell properties to tenants and redistribute wealth via a discount paid for by the nationalisation and forced sale of Council homes. He has allowed British steel production to collapse and let companies owned and run by his chums in the Chinese Red Army to supply us with cheap "dumped" steel. Only French and German state nationalised industries are allowed to own and run our railways, water utilities and power companies. As a typical Stalinist, he is planning to outlaw strikes and ban independent trade unions, as well as cutting off funding for rival political parties. So I think the evidence is clear and compelling. MI5 should put aside the old school ties and step in and do their duty.